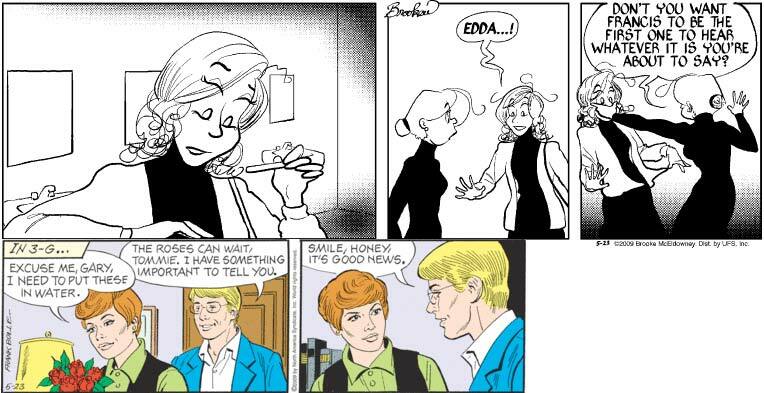 Hey, remember how newspaper Spidey used to be married to Mary Jane, but then a enormous wall of text told us that he wasn’t anymore, because we had gone back in time to his single college days? Well, it’s not even six months later and apparently we’re done with that. This is fully in keeping with the overall milieu of the strip, in which anything can happen at any time because whatever. I do note with some amusement Peter’s shock in panel two about getting married without gainful employment, since much of the “drama” of the pre-time-jump strip revolved around Peter whining endlessly about how his underemployment made him less of a man. I guess they got hitched even without him having a steady job, proving that the best way to overcome obstacles in this life is to lower your standards. All this jawing is leading me to believe that this storyline will, against all odds, have a happy ending after all: Dr. Jeff’s adolescent crush, to whom he never dared reveal his feelings, has returned in the shape of the man’s handsome young son! Now, in a more enlightened age, their love can finally be expressed. As added bonuses, Mary will have her heart broken lose control of her current whipping boy, and Adrian will once again be permitted to chose her own romantic partner (which will ultimately lead to her kidneys being stolen and sold on the black market, but that’s a small price to pay). These two strips are stacked pretty much right on top of each other on my Chron page, so naturally my assumption upon reading them was that Gary was pregnant.